Toad in the hole is a traditional British dish consisting of sausages in Yorkshire pudding batter - a meal that always goes down well when served with onion gravy and peas. 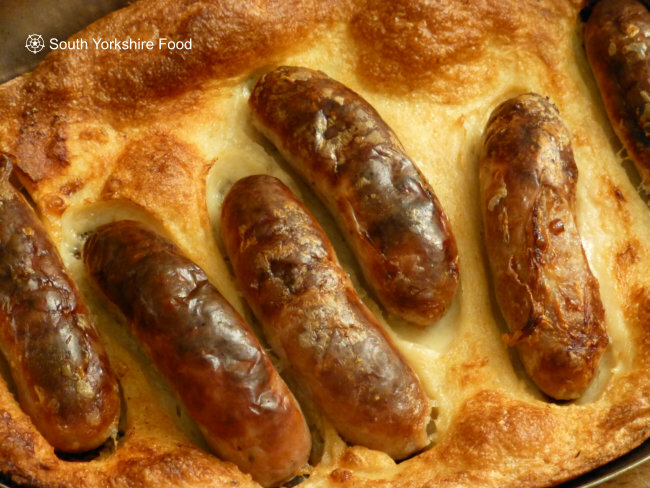 The history of the dish goes back about 200 years, but no-one is really sure where the name came from - a common view is that the sausages look like toad heads peeking out from a crevice in a rock. However scary the name may sound, you can be sure it tastes delicious! Serves 3. Sieve the flour with the salt into a bowl and make a well in the centre. Gradually work in the beaten eggs, then whisk in the milk - the consistency should be like single cream. Pour the batter into a jug and leave the it to stand for at least an hour. Heat the oven to 220°C/200°C fan/425°F. Add the goose fat to a 20x30 cm roasting tin and add the sausages, first snipping any links between them. Roast for 10 minutes. Now take the hot tray from the oven and pour in the batter around the sausages. It will spit and spatter when you do this. Quickly put the tray back into the oven and roast for about another 30-40 minutes. Whilst the toad is cooking, make the gravy by sauteing the onions in the oil, in a nonstick pan. Cook them gently until they are soft - about 20 minutes. Now add the sugar, mix well and cook for another couple of minutes. Add the flour to the onions and mix well to ensure that all the onions are coated. Now slowly pour in the beef stock, stirring all the time, and bring to a simmer as the gravy gradually thickens. Cook on a low heat for 5-6 minutes. Check the seasoning. When the toad in the hole is done the batter will have risen, and a knife point stuck in the centre should come away cleanly. Cut the toad in the hole in to wedges and serve with the onion gravy and peas.